Find £14.99 Off Men's Tops in the Spring Sale at Superdry Add some style to your wardrobe with tops from Superdry. Enjoy £50 Off Women's Sportswear in the Spring Sale at Superdry Put some style into your sports with sportswear from Superdry. Free Click and Collect on Orders at Superdry Don't waste money on delivery fees, just head down to your local Superdry and your order will be ready and waiting! 4 for £55 on Men's T-shirts at Superdry Catch this great money saving deal while you can! 25% Off Tops at New Look - Perfect For Spring! Superdry is that cool and contemporary brand that has taken the UK by storm since its launch. With a great following of fans who love its combinations of classic style with contemporary Japanese graphic design - here is where every piece is a truly fashionable investment. With over 130 UK branches on high streets all over the country, plus concessions in lots of major department stores, Superdry is the urban wear go-to that's loved by celebrities and fashion aficionados all over Britain. From stylish, relaxed jackets to the latest hi-tech gym wear, Superdry is a brand that can fit in with your lifestyle and uplift your casual wardrobe with some edgy looks. With quality fabrics that go the extra mile, you'll find performance in all of the distinctive collections. Men and women, the athlete, sport's amateur, yogi and all fitness freaks can find joy here. With casual dresses perfect for a festival and even formal attire too for work or an evening on the town - you can always make your mark with Superdry. How do I use my Superdry discount code? Click 'apply code' and if no code is necessary, your discounts will be applied automatically so you can check out securely. Sign up to the newsletter at you'll be in with the chance of winning vouchers every month, stay in the know about new releases, exclusive discounts and much more! Does Superdry offer free delivery? Superdry offers free delivery on every UK mainland order (as well as in some other locations like North America). Where is my nearest Superdry Store? You can find a directory of all Superdry stores here on their website, so you can find the details of any branches you want to visit. Does Superdry offer student discount? Although Superdry doesn't currently offer student discount, it does often run student events and promos via UNiDAYS - so make sure that you're signed up - just incase! What size should I order at Superdry? Superdry clothing is generally slim fitted, so the brand advises you to bear this in mind when you pick a size. You can find a size guide on their website to help. Superdry delivery is free as standard - as is Collect+ and Click and Collect. Dispatch is same day, so orders should taken between 3-5 working days. Next Day Delivery is available for £3.95 -order by 10pm. Next Day pre-12pm Delivery is also available for £6. Designated Day Delivery is available for £3.95. Evening Delivery can also be ordered for £6.95. Simply fill out your return form and affix your included returns label to your package - and return with 28 days of receipt. If you don't have your returns label, get in touch with Superdry direct. Returns are free via Collect+. You can also reach Superdry online via their contact form. 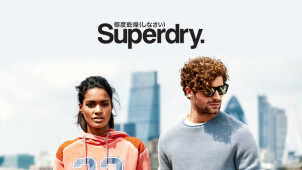 Superdry is a brand that unites Japanese, American and British style to create unique looks that are effortlessly fashionable. From cool jackets and tees through to party dresses and yoga kit that'll see you through the season happy, Superdry applies its own fresh style to everything in its catalogue. With a Superdry promo code you can update your everyday wardrobe for less. With new and trendsetting styles for men and women added all the time, for yourself or to gift another - get inspired at Superdry. Superdry's major UK flagship store on Regent Street in London has a Premium Lounge – a place where you can go and get personal shopping and general pampering from the Superdry brand. While you'll need to visit Superdry in person to enjoy this experience, you can book appointments through their website while you scout for new threads with a Superdry voucher code perhaps! If you are one of Superdry's many cult fans, this can be something you'll definitely want to plan if you are doing a big London shopping trip! Superdry may be best known for its streetwear, but there is also h an excellent range of sports clothing that is perfect for the gym, the track, or wherever else your fitness activities take you! If your detox is still going, use a Superdry discount code and you'll save on comfortable sportswear to support your every move. Find bright hoodies or track pants as well as shirts and shorts made in performance sports fabrics that wick away moisture. Now you can look great while you work up a sweat with sports gear for both men and women by Superdry.